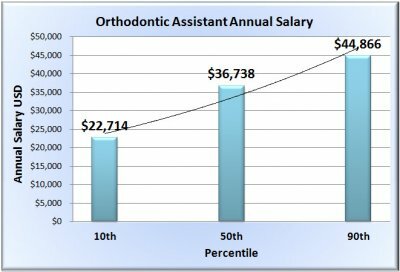 The average salary for an orthodontist assistant ranges from $24,011 to $45,925 per annum, with the median annual salary being $33,853. The average hourly rate is between $11.63 and $21.82 per hour. 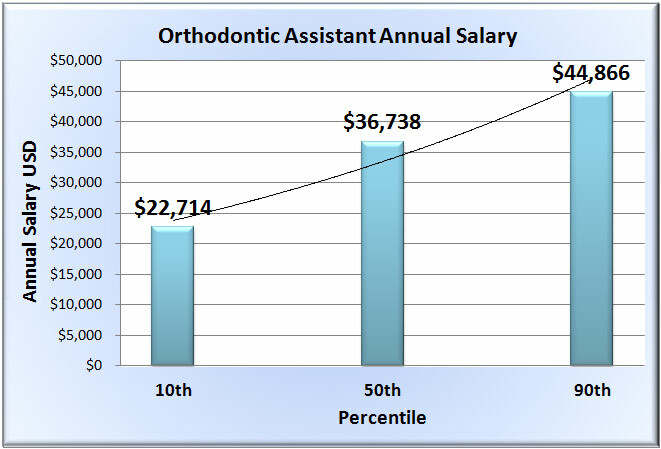 Salaries for orthodontist assistants may vary depending on level of experience, certification and geographic location. States with the highest average salaries for orthodontist assistants include New Hampshire ($43,480), Minnesota ($43,420), Alaska ($41,970), District of Columbia ($41,730) and Massachusetts ($41,290). Bonus levels are variable among orthodontist assistants, but higher bonuses are generally associated with more experience. Those with 1 to 4 years of experience may earn a bonus of up to $99.04, while orthodontist assistants with 5 to 9 years of experience, may earn up to $201.68. More than 10 years of experience can lead to bonus payments above $250. About 300,601 dental assistants were employed in 2012, a figure which includes orthodontist assistants. Most orthodontic assistants tend to work in orthodontist or dentist offices. The number of jobs for orthodontist dentists is expected to increase from 2012 to 2022, with the employment growth rate for dental assistants in general estimated to be 25 percent.